Fig Tree Books LLC, 9781941493007, 392pp. 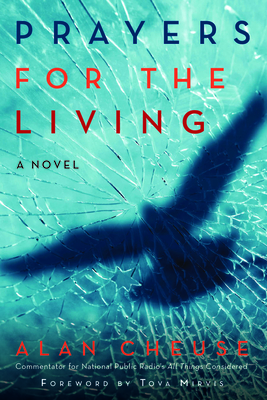 Prayers for the Living is a novel both grand in its vision and loving in its familiarity. Presented in a series of conversations between grandmother Minnie Bloch and her companions, Alan Cheuse, National Public Radio commentator on All Things Considered, unfolds a layered family portrait of three generations of the Bloch family, whose members are collapsing under everyday burdens and brutal betrayals. Her son Manny is a renowned, almost legendary rabbi. Respected by his congregants and surrounded by family, no one suspects that he yearns for a life of greater personal glory, but when an oracular bird delivers what Manny believes to be a message from his deceased father, he abandons his congregation in pursuit of a life in business and his entire life spirals out of control. As Manny's fortunes rise in the corporate realm, he falls deeper into an affair with a congregant, a Holocaust survivor, his wife sinks deeper into alcoholism and depression and his daughter, traumatized by a sexual scandal at college, makes Manny the target of a plot to shatter his newly-found empire. The devoted family matriarch, Minnie, observes and recounts the tragic downfall of her family, unable to save them from themselves. Alan Cheuse has been reviewing books on All Things Considered since the 1980s. Formally trained as a literary scholar, Cheuse writes fiction and novels and publishes short stories. He is the author of five novels, five collections of short stories and novellas, and the memoir Fall Out of Heaven. Cheuse teaches writing at George Mason University near Washington, D.C., spends his summers in Santa Cruz, CA, and leads fiction workshops at the Squaw Valley Community of Writers. Tova Mirvis, author of the foreword, has published three novels, Visible City, The Outside World and The Ladies Auxiliary, which was a national bestseller. She has been a Scholar in Residence at the Hadassah-Brandeis Institute at Brandeis University, and Visiting Scholar at The Brandeis Women's Studies Research Center. She lives in Newton, Massachusetts, with her family.